A roster of the favorite African animals are on the pattern of this 10-pocket dauber bag. Ten dauber sized pockets wrap around the outer edge of this bag. Two beaded drawstrings help to open and close the bag. 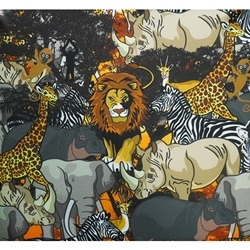 The pattern portrays a plethora of exotic and wild animals from the African jungles and plains. This dauber bag comes with a complementary matching pouch. Daubers purchased seperately.